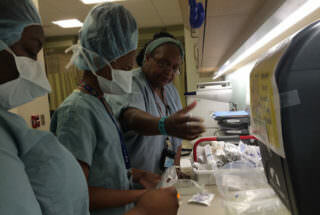 Students from King/Drew Senior High Medicine and Science Magnet train at an outpatient center. LA Unified’s Local District South will receive two $20,000 planning grants to apply for replication grants for two South Los Angeles high schools from Great Public Schools Now, the district and the organization announced Monday. The nonprofit organization will award up to five high-performing district schools up to $3.75 million in replication grants this spring. Schools that did not apply for nor receive planning grants can still apply for the replication grants. Public Service Community School at Diego Rivera Learning Complex and King/Drew Senior High Medicine and Science Magnet are the two schools that will benefit from the planning grants. GPSN officials said the grants will be used to help teachers, parents and administrators complete their applications for the replication grants. Earlier this month, the LA teachers’ union, United Teachers Los Angeles, announced that teachers at four campuses had overwhelmingly voted to reject the GPSN grants. The district had intended to apply on behalf of those schools and it withdrew its application for a planning grant submitted for San Fernando High School. GPSN said Monday the application was for San Fernando High School’s Math/Science/Technology Magnet. Representatives from the Broad Foundation and Walton Family Foundation, of Wal-Mart, sit on the GPSN board of directors. GPSN also released the complete Request for Proposals for the replication grants, which must be used to either open a second campus or significantly expand the number of seats available in a program. The deadline to apply for the replication grants is March 8, and the winners will be announced in April. The grants must be used to serve students in 10 high-poverty neighborhoods determined by GPSN to be lacking in quality schools, mostly in South LA, East LA and the northeast San Fernando Valley. The replication grants must go to high-performing schools, as GPSN’s mission is to “do more of what works,” not turn around under-performing schools. Eligible schools must meet the minimum criteria of: 50 percent of the students met or exceeded proficiency in ELA or math on the latest California Assessment of Student Performance and Progress results or students scored significantly better than charter and district-operated schools nearby in both math and ELA, but no fewer than 25 percent of its students performed at proficient levels. The replication grants will range from $50,000 to $250,000 annually for up to three years. The first round of funding will be awarded in the spring for the 2017-18 school year. Applications will be evaluated by an independent advisory committee whose members will make recommendations to the GPSN board of directors, which will make the final decision. The organization is making a separate process to fund charter schools. In its first grants awarded this summer, Equitas Academy, which runs three charter schools in the Pico-Union neighborhood, received a $2 million grant from GPSN to help fund its new elementary school construction project. King/Drew is a popular magnet program. In 2016, it was named one of the nation’s top high schools by U.S. News and World Report. On the Smarter Balanced state standardized tests taken in the spring, 76 percent of King/Drew students were proficient in ELA and 41 percent were proficient in math. (The district average is 39 percent proficiency in ELA and 28 percent in math). Students at Public Service Community School scored 69 percent proficient in ELA and 13 percent proficient in math. King/Drew enrolled 1,577 students in the 2015-16 school year, 60 students fewer than in 2011-12, district data show. Public Service Community School enrolled 536 students in 2015-16, an increase of 214 students compared to 2011-12. King/Drew was established in 1982, while Public Service Community School opened in 2011. About 15 percent of Public Service Community School’s students are English-language learners and about 83 percent are low-income. At King/Drew, about 88 percent of the students are low-income and 1.5 percent are English learners. Public Service Community School is a pilot school on the campus of Diego Rivera Learning Complex. A pilot school is a district school model in which teachers create and execute the school’s mission and have greater autonomy over decisions like the school’s budget. Teachers at pilot schools remain members of the teachers union. GPSN will hold a town hall forum in South LA on Dec. 10 from 11 a.m. to 2 p.m. at Watts Labor Community Action building, 10950 S. Central Ave., 90059. Castrejón said the town hall was previously scheduled, but now that the area has two schools that are actively pursuing the grants, the forum will be focused on that and hearing from families in the community. “Hopefully we’ll have an opportunity to really hear more about how people might be receiving the news of this opportunity and our investment,” Castrejón said.